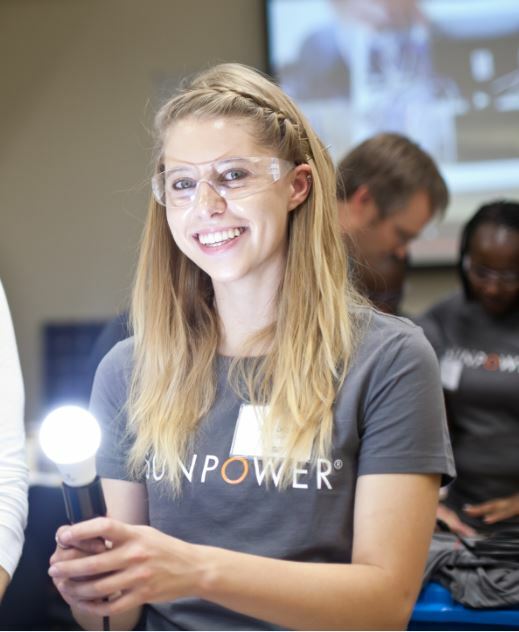 Every year, SunPower invites hundreds of high school students and teachers to participate in its SunPower Horizons™ Summer Solar Energy Academy, a week-long rigorous internship held at sites throughout California that offers participants a practical, hands-on experience of what it’s like to work in the solar industry. We wanted to share more about this innovative program from a true insider. So we asked Ashley Osborne — a two-time Solar Energy Academy participant now majoring in mechanical engineering at the University of California, Davis, to tell us all about it. Last summer Osborne also completed a 10-week summer engineering internship at SunPower. How did you become interested in solar? Well, I was always pretty good at math and science and had the opportunity to take engineering classes in high school. My junior year engineering teacher told me about SunPower’s Solar Energy Academy, so I applied and got in. The week I spent at the Academy that summer was my first real introduction to solar. What particularly caught my attention was a solar lantern project they told us about, giving these lanterns to kids in third-world countries so they can get to school and do their homework. It was this small application of solar making such a huge impact in people’s lives. While I’d been interested in engineering before, seeing how it could be used in the real world like that really got me passionate about pursuing it further in college. What else did you get to do in the Solar Energy Academy? It was great, and they definitely kept us busy! We had lessons every morning where we’d learn about solar. We also took field trips to see a school’s solar installation and a manufacturing facility. But most of our time was spent on a big team project, where we worked together to identify which of our houses would be best for solar. It all wrapped up with a presentation on the last day, when they brought in professionals to pick the best presentation. To me the coolest part was that I really did get the chance to apply what I was learning, and presenting just helped solidify it. Why did you attend the Solar Energy Academy the next summer, too? (I attended) as a student-mentor and teaching assistant in that second summer. I helped educate other students about solar and support them in their projects. It was great to be a participant again, but this time in more of a leadership position. It also helped me see what we were learning — and what I was teaching — from a whole new angle. What was your 2016 summer internship at SunPower like? I worked in SunPower’s Richmond office as a performance-engineering intern for 10 weeks. I loved it, actually being in the office for 40 hours a week and seeing how it all works. My main project was to work on the simulation software SunPower uses to help customers understand how much power they can expect to get from their panels based on weather and other conditions in their area. It gave me tons of insight into what it’s really like to work in the industry. And now you’re about to graduate. Congratulations! Where do you see yourself going from here? Well, I’m definitely hoping to get a job working in the solar industry, and of course doing it at SunPower would be the best! We offer programs like this to our solar school customers. Learn more by visiting us at the CASH 38th Annual Conference on School Facilities Feb. 20-22 in Sacramento, CA. You can learn more about the Solar Energy Academy and other SunPower Horizons programs by visiting us.sunpower.com/horizons or sending an email to horizons@sunpower.com.